Thirty-nine have co-authored peer reviewed publications and 50 have presented talks or posters. Thirty-eight of the students have been female and 27 minority students. Ten students have gone on to medical school and 18 to a graduate program in the sciences. Summer: Luisa Dickson; Curren Mbofana, Alicia Morgan, Wayne Ong, Vishwanie Persaud and Alex Samma. Alex, Vishwanie, Wayne and Alicia all came to the ACS NERM meeting in Burlington, Vermont. Alicia, Elizabeth, Luisa and Colleen showing off their summer '07 T-shirts. 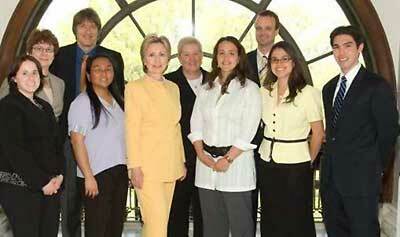 Scott presented his work on Capital Hill and we posed for a photograph with Hillary Clinton. 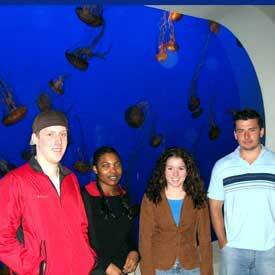 Nate, Curren, Emily and Justin at the Monterey Bay Aquarium. More about students and pictures of students.